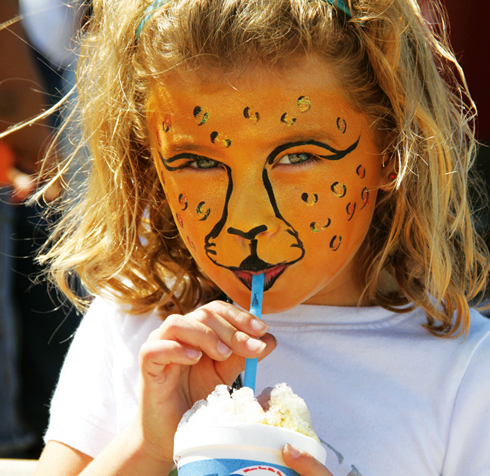 Annie Simonich, leopard clad, sips on her favorite flavored snow cone from the Tropical Shaved Kona Ice stand. On Saturday, patrons enjoy their fair food in the shade under the dining tent. Cortney Abbe and her mom, Susan Green, visit with artist Roy Morgan while admiring his breathtaking art exhibit. On Saturday, fairgoers enjoyed the beautiful weather on the OCCC campus during the 2010 Arts Festival Oklahoma. Evangeline Morrison, two years, smiles with delight after having her face painted for the first time. Lauren Axton of Norman gets a butterfly design to match her little sister, Sheridan Morrison. Axton promised Sheridan she would be a butterfly too. Artist, Janice Freeman, transforms Sheridan Morrison, six years old, into the butterfly she wants to be. Briana Harris, a freshman computer programming major at OCCC, takes in the vastness of astophotogher John Chumack’s galactic photography. Kaylynn Magers, is happy with her facepaint design. Artist, Janice Freeman, made lines of kids smile with her wonderfuly creative, facepaint application. Astrophotographer, John Chumack, describes one of his greatest works which is a photograph of the planets aligning. 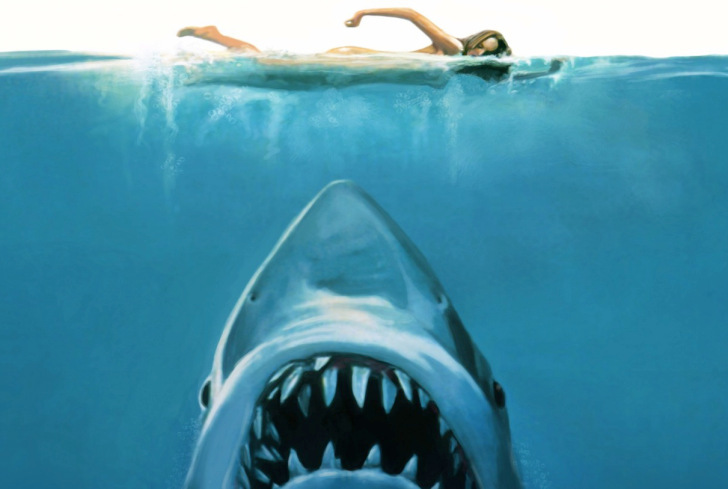 Chumack’s work has been features on the cover of Time Magazine. Find more of his work at www.galacticimages.com. Jim Elliott, of Oklahoma City, orders BBQ sandwiches from JR’s Concessions on Sat. After sampling kettle corn from vendor Tiffany Barnhill, patrons Mike and Helen Dill are ready with cash in hand to buy a big bag. Patrons sample kettle corn at the Arts Festival Oklahoma early Saturday. Pirate, George Heartman, age 7 and spiderman, Jackson Kalla, age three and a half play in the the gigantic sand box created for the Arts Festival Oklahoma Childrens Creative Center. Lanny Fiegenshuh. on harmonica, helps to creates those down home folk sounds of the Simoleons band. 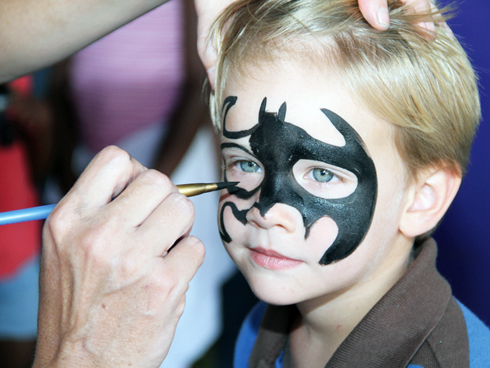 Batman fan, Westin Parker Morrison, holds steady for face painting artist, (name of artist). Children anxiously waited in long lines to transform their appearance. 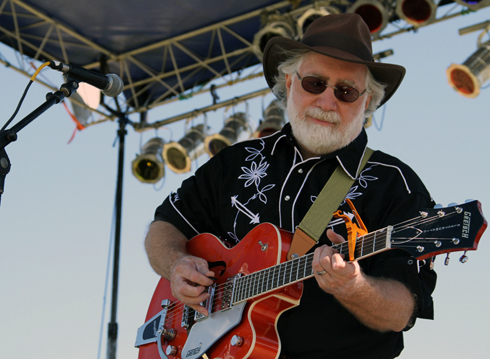 Ray Wyssmann, guitarist, entertains the Arts Festival Oklahoma crowd. The down home sounds of the american folk band, the Simoleons, welcomed the early fairgoers on Saturday. 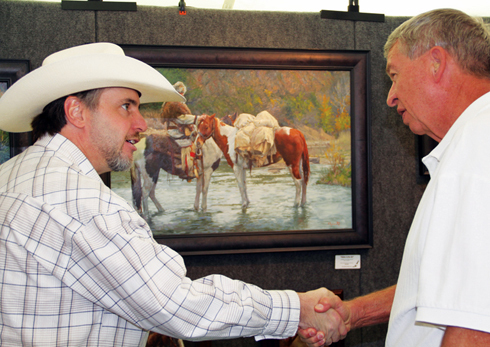 Artist, Jim Clements, greets Emil Coffey, a local admirer. Coffey loves art that tells a story. 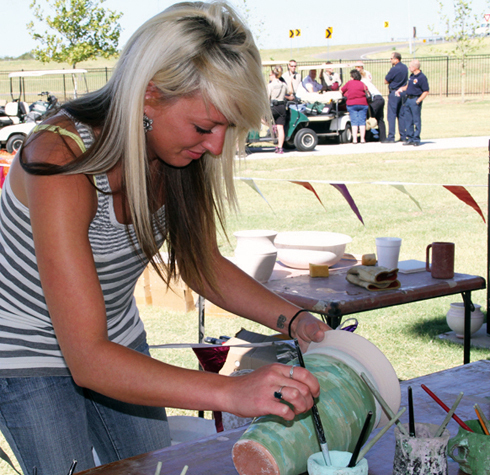 Cortney Abbe of Oklahoma City, enjoys painting the vase that she chose under the pottery making tent. After completing her design the vase was fired in a kiln for aproximately forty five minutes. Pirate George Heartman, age 7, digs in the sand box under the Children’s Creative Center tent. Patrons choose their favorite flavors to top snow cones from Kona Shaved Ice. The vendor,Tropical Shaved Kona Ice, serves up shaved ice. Patrons then get to choose their favorite flavor and add it self serve style. Sisters Emma(left) and Annie(right) Simonich sip on snow cones from the Tropical Shaved Kona Ice stand.